Late one evening, a woman came home from work after a long day at the office. When she walked into the kitchen, she found her husband walking around wielding a fly swatter. “Albert, what are you doing?” she asked. “I’m hunting flies,” he said. “Oh, I see. Did you kill any?” she asked. “Yep, three males two females,” he replied in a confident tone. 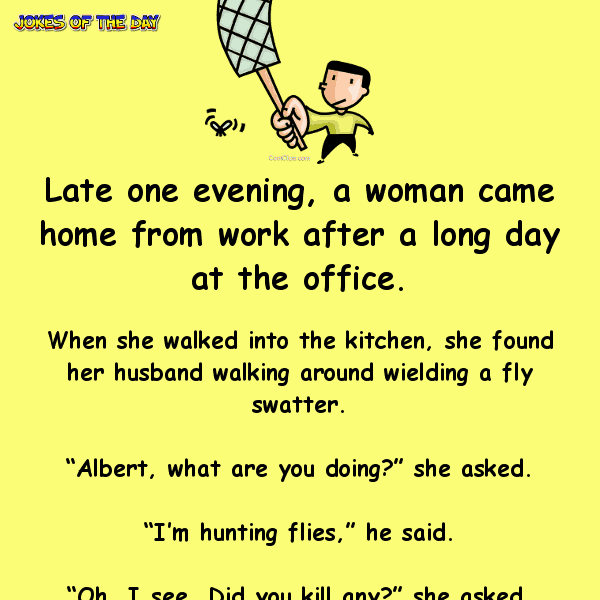 The woman was intrigued by her husband’s apparent fly knowledge.